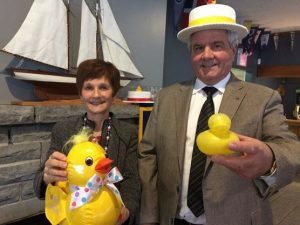 ST. CATHARINES — It’s a sure sign of spring, along with the blooming flowers and April showers, area Kiwanis clubs have become all quacked up promoting their annual Duck Race. 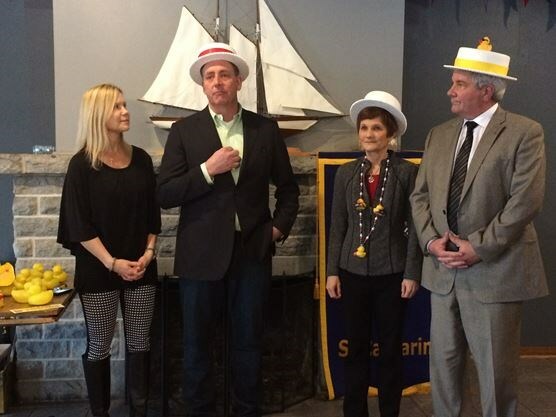 Set to take place on Father’s Day in June, Kiwanis members and event sponsors gathered at the Port Dalhousie Yacht Club on Thursday to announce tickets are now on sale for the annual fundraiser. This year there is $15,000 in cash and prizes to be won, including the top prize of $10,000 cash. Cindy Paskey of the Kiwanis Club of St. Catharines said the goal for this year’s event is to raise $50,000, with 100 per cent of the proceeds going back into the community. The duck race is organized in partnership with area Kiwanis Clubs throughout the region, including St. Catharines, Niagara Falls, Welland. Tickets are $5 each and are available at Avondale Stores throughout St. Catharines and Niagara Falls, as well as all Goodwill stores in the region, and from Kiwanis Club members. Paskey said people can also purchase a “flock of ducks,” meaning an entire book of 10 tickets for $50. Last year, it was a group of friends in Niagara Falls who went in on buying a flock of ducks that ended up winning the grand prize. This year, Propack Processing and Packaging Inc. has come on board as the main sponsor. This marks the first time the manufacturer and supplier of automated packaging machinery has been involved with a Kiwanis Club initiative. Paskey said everyone’s invited out to Port Dalhousie on Father’s Day, June 18, to watch the annual duck race. At 2 p.m. a container full of rubber ducks will be lifted from the yacht club by crane and emptied into the water. The ducks will then float through the race, the first 12 ducks to cross the finish line will get a prize. The first one through wins its owners the grand prize. For more information, visit www.kiwanisstcatharines.com.